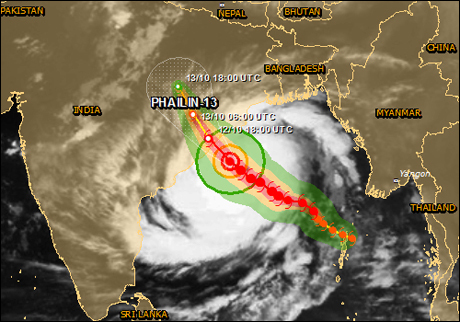 How Bad Will Cyclone Phailin Be for India? Thread: How Bad Will Cyclone Phailin Be for India? Disaster looms for India as ferocious Cyclone Phailin, currently equivalent in strength to a Category 5 hurricane, bears down on the subcontinent ahead of its expected landfall tomorrow night (Oct. 12), local time. it appears that this cyclone started between Thailand and India, it is possible that a new cyclone can start in the same area but instead of going to the west it will go to the East? Last edited by andmel; 12th October 2013 at 22:27. Is this not a PhotoShop Mr DK? Will we get any back lash from the winds etc??? like maybe will we get some more rain?? But Dodge....put a rider on that ffs. What if it strikes Kamala? Last edited by steve w; 13th October 2013 at 05:11. The Guam one will track north but the other one is going west and will hit Vietnam and then Thailand next week. Hopefully it phails to do much damage. Well it rained here today????? ?, I'm blaming the phalic tornedo!! I'm going out tomollow without a brella and ferk it!!!! !